Elliott Wave Theory, classic TA, and frequent doses of sarcasm. Join the ongoing discussion with our friendly, knowledgeable, and collegial forum community here! Today could be a key day toward gaining more confidence in one of the two main counts, because -- as those of you who own digital watches already know -- today is the first of May. The first of any month is frequently bullish, since there's often a big bag of fund money moving into the market. If the bulls are able to show some strength today, it's probably time to start betting on the alternate count. Conversely, if the bears can keep control, then the preferred count will gain a bit of a confidence boost. There are two main reasons I remain in favor of the more bearish count, and I'll outline my reasoning in a moment. 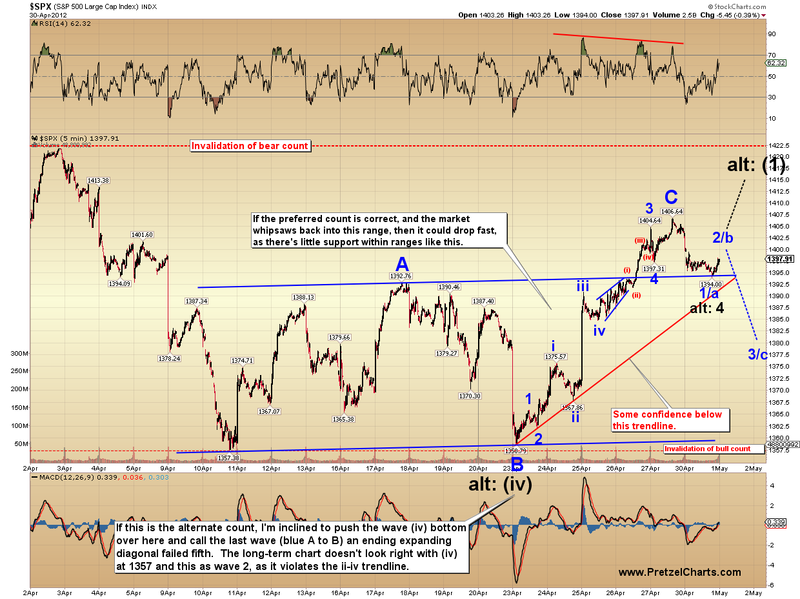 Yesterday's decline appeared impulsive, meaning it appeared to complete a five-wave move. So there might be a small bounce, but if that was wave a or 1 down, it should be followed by more selling. A material break of 1394 should get the ball rolling. Conversely, if bulls can take the market back above the recent 1406.64 print high, then the alternate count is probably unfolding. I'm inclined to favor the alternate if new highs are made today, because that would then mean the market was up 6 out of the last 7 days, which is often (not always, of course) indicitive of a more meaningful bottom. So if new highs occur, the favored odds shift to the bulls -- but currently the odds still remain with the bears. As such, on the chart below, the blue count is still the preferred count, and suggests that the entirety of the recent rally is part of a corrective structure, which will be followed by new lows. 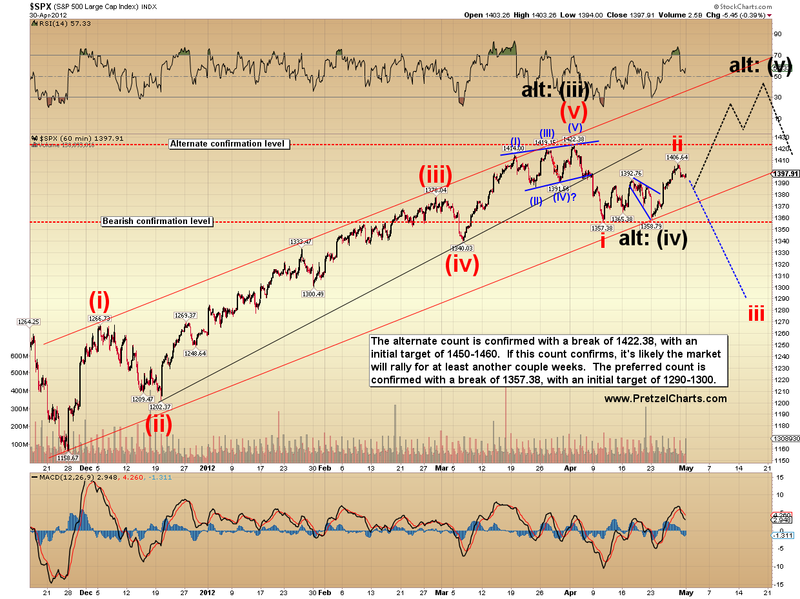 The alternate count would view the recent lows as a base from which a larger five-wave rally will unfold. As I said, I think tomorrow will go a long way toward adding confidence toward one view or the other. One of the reasons I remain in favor of the rally being corrective is the Nasquack, which looks to have formed a clear five-wave decline. That suggests that another five-wave decline will follow, though it does not preclude further sideways corrective action first. The Nascrack also looks like a small impulse down, to be followed by new short-term lows after any bounce completes. As a refresher, here's what the big picture looks like. There are already targets for each count, but no confirmation. As I've been stating, I continue to feel that the preferred count is slightly more probable. Yesterday I mentioned that the Euro/US dollar currency pair is trading just beneath intermediate and long-term resistance levels. 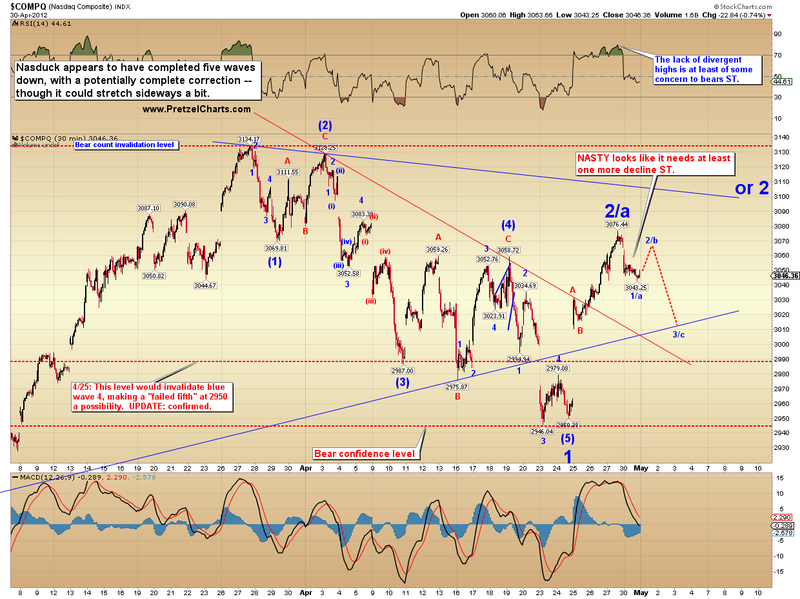 If it does break out here, then equities bears are probably going to need to come to terms with the alternate count. But again, odds here favor that it won't break out, since it's facing dual resistance -- and since it's formed a descending triangle, which leads to a bearish resolution 64% of the time. A descending triangle indicates that sellers are coming back into -- and taking control of -- the market earlier and earlier, which is why the peaks become progressively lower. So sellers are getting stronger, while buying interest remains flat. The Euro/Dollar chart is another reason I remain in favor of the more bearish equities count. However, 64% odds are just that -- and there's no rule to guarantee that the 36% odds won't come to play on this particular occasion. In either case, today's action could go a long way toward telling us if the higher odds will take the intermediate-term prize, or if Uncle Ben's loaded dice will once again guarantee that bears lose to the house. Trade safe. I do not think it is done with testing that 91 ES area yet. . . . It's a tag applied to a certain troll. Jeez...WWWCI calls are worth actual money...it's freakin' bankable. When did WWCI show up? I must have missed the posts. A couple of days ago. Posts were in all CAPS. I almost never delete posts. One of my moderators must have done it, which is why I didn't see them. about 85-6. Dunno what will happen, both are possibilities. Feel 64% "sure" that you were being funny at the end, and 36% "unsure" if you were serious. there's no volume K7: been falling constantly since the 20th, INDU and SPX. Be weird if it can make another 3 waves up with shrinking volume. I guess we'll sooon know. Yep, seeing the same. If it breaks 1.3276, it's prolly gonna pop over 1.33.
my Disgust is acting up, it takes minutes before it will allow me to post. With that serious decline in the Aussie dollar, and the effect it had on the Aussie:Yen cross I just don't see how equities can hold up here. The reason I've used the Aussie:Yen cross exclusively as a measure of risk is because of the use of those two currencies in the currency carry trade circus. This drop in the Aussie is going to cause a lot of currency traders to find themselves seriously underwater and they're going to "have to" unwind some positions, both in currencies and in equities. Unless for some unknown reason the currency carry trade is no longer providing clues about what the big boys find to be risky, equities should respond to this deflationary event just like any other. Ahem... like the Euro crisis that apparently doesn't exist. Cynicism aside, the correlation between the Aussie:Yen cross and equities has been nothing short of stunning. I don't see why that should suddenly change today nor in the coming days and weeks. Something is missing in the way of alt count at this point. Technically, I don't 'count' them myself, so I can't pinpoint the problem. But my work pretty clearly is looking for a third path, neither of which match your main options this morning. I have us in a weak bull cycle, with key support in the 1390 area (spy basis) and we may well sag down to there today, but recover smartly after that. Into the final high. Can't say if we best 1422 or not. But we should top this week. No chance for 1440. So I'm not immediately bearish, but this is hardly a bullish read either. If that lines up with 1390 spy basis, I concur. Then higher. broke 94.25, heading back down though, stop grabber? One of my favorite restuarants, P.F. Chang's has approved a deal to go private. Would be a nice day to have some of the stock, up 30%. Anyone else enjoy their food? global currencies markets? Maybe they're the only player left? So it appears that after years and years of incredibly close correlation between the currency carry trade and equities, that relationship no longer exists. I've seen it all now. jeez, eur/$$ just tumbled, WTF? The fix is in...nothing makes sense here. It was the silly ISM number that came out very positive 54.8 when everyone was expecting 53 or so. Last month was 53.4. New orders looking good. Don't know how the government twists these numbers though. something bad is going down. . . .
Do I have this backwards? EUR/USD drop should be good for bears regarding equities, right? So it just dropped big and equities fly up. Maybe the wires in my brain are crossed this AM and I just have this backwards? is it possible that the eurozone just bought into USD equities big time where they are exchanging euros for dollars then buying equities? my W%R on the 120 is going crazy, never seen this, on the f-cking 120 flipping up and down????? Is this the opposite of a flash crash? Katzo when you say bad what do you mean by that? What do you suspect? If that occurred the dollar would be going down. It is the silly ISM number I reported below. News is attributing it to ISM numbers surprising on the high side. Nope, you have it correct. Currencies markets all over the world are screaming "risk off" and equities take off as if there was no such thing as a currency market at all. Today's market action in the face of what's happening in the currency markets just makes no sense at all. It is the greatest case of market manipulation I have ever seen. Nonetheless, the insanity of it could still ignite the bullish side of things... against all common sense and logic. I don't care that some of the market internals signals are cautioning that higher prices 'could' be coming. They are issuing those signals from levels that are not at all particularly low on a historic basis. So they're not making the 'strongest' case for higher prices. What's happening is the currencies markets trumps all... and the markets shrug it off. It's the closest thing to insanity I've ever seen. I think that may behavior may increase as we are officially the best horse in the glue factory, especially after today's ISM. Is anybody else having to wait 2 or 3 minutes for the comment boxes to become operative? DJ and SP still bullish for me. Targets I am a little shy to post, guess none won't to hear them here. Silver I am wait and see. Part still running. Where does it end? When do they start to hang for this type of manipulation? And I don't care about potential wave counts that could have portended higher prices. They didn't take into account a crash in the currency carry side of things. And I don't care about market internals that would support a bounce because neither did they know about this carry trade unwind. The markets should be headed sharply lower because of the currencies issue. It's so huge it trumps all. All but Goldman I guess. It is quite crazy but low volume days will do this type of thing. Goldman is down for the day too. LOL, yes it can go both ways, at least moves like these take some of the guessing out of it, which is always nice. Attached a quick bollinger band chart with "my" usual 0.5, 1, 2 stdev bands (from the 20d-SMA). As one can see SPX is now in between the 1 and 2 stdev upper band, which takes some serious strength to get there. Given I am a conservative investors when it comes to market related tickers (SPY, QQQ, DOG, SH, etc) I wait for such a confirmation (as well as levels pointed out by PL). The side ways slop of pretty much most of April is something I (try to ;-) ) stay out of. you are a strong contributor here; I would like to hear your targets. either the $INDU 80 >> 120 will kick in or it wil lfrustrate itself up here at 07 and eventually head down, ST call. I think down. The USD is rallying based on the ISM that implies US growth and therefore no further QE. The stock market is rallying based on the implied US growth. It's actually markets reacting to US economic outperformance in a rational way, even if I don't like it. INDU has now made new highs, which to me suggests SPX, etc will follow. ps: SERIOUS negative divergence in the stochastic oscillators (MACD, SSTO, etc) suggesting eventually a spank down. When? dunno. But, will happen for sure. do you put a limit order out there for your target or are you just quick on the trigger and watching it? 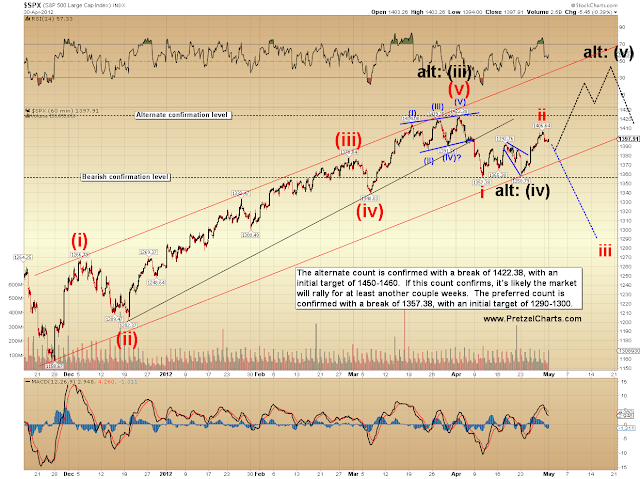 The larger assumed wave up should be completing soon and lead to a decent retracement. CVX sure does look like it's in a wave 3 up instead of a wave 2 down. C waves are third waves. I believe I warned everyone intraday, when it broke roughly 104.75, that it looked like it was headed to 108ish. By golly I think this might be what's going on. Either today's rocket finished of the 'c' wave, or it's just wave 1 of 5 higher. I think the entire up-move is too big to be a new wave 1 of 5. It that's what it is then we're probably looking at SPX 1500 almost. So I'm leaning toward it being nearing the completion of the 'c' wave. Right now it's length is 1.61 times what would be the 'a' wave. YW. Sometimes I feel like the third grader hangin' out with eighth graders. Someday I hope to have the confidence to put this stuff to work for me! 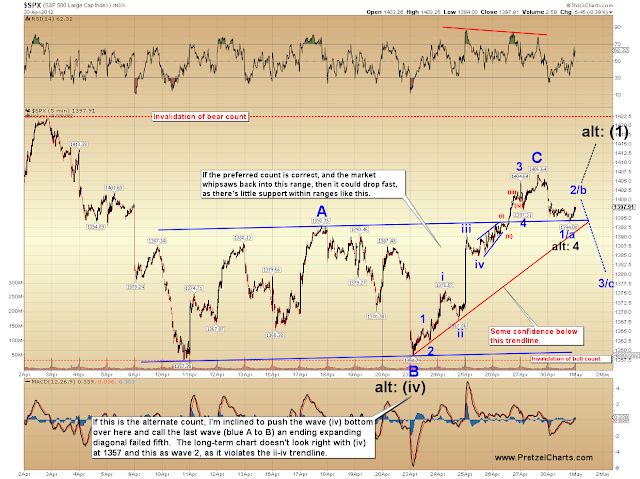 PL, do you think we're still due for a 3rd wave down starting from here? what's the practical difference if the top was at 1422 or 1452?" Maybe I'm reading into it a bit much, but it demonstrated a sense of correct confidence that I imagine you experienced in 2008. Thanks again for all of the time and effort you put forth for our benefit. "From here" would be stronger than I feel. I wouldn't be surprised to see it print 109-110. But from somewhere in this general vicinity, yes, there's been nothing to change my view yet. Those ISM numbers shafted the QE hopes....everything is peachy. You're welcome. To be brutally straightforward, though, my confidence right now is lower than it was in '08. This market has been distorted by an unprecedented level of intervention -- all the "64% chances" seem to turn into zero lately... so it's harder to predict. I should also add that I'm now beginning to accumulate shorts in CVX again today -- so my money's going where my mouth is. Not gonna jump in all at once, though, because as I said, could be a little more upside. And if it turns into a five wave rally, then I'll take my lumps and jump out. "in expanded flats, wave B of the 3-3-5 pattern terminates beyond the starting level of wave A"
I should have said "... or it's just wave 1 of 3 of 5 higher". Normally I'd just edit the comment but it's the editing (if there's a link involved in the original comment) that invariably ejects a lot of my comments to the spam bin. Or somewhere. I think this probably has more to do with the fund money flow I mentioned, and less to do w/ ISM -- other than short covering adding fuel to the fire. Perhaps the market forgot that good ISM = no QE3 = bad for the market. Thanks PL. I highly value your opinion, and knowing that you're putting your money where your mouth is means that much more. I bought a put this past Friday and wish I had had the patience to wait a little while longer. Fortunately I only bought one. I'm sure leaning that way PL. 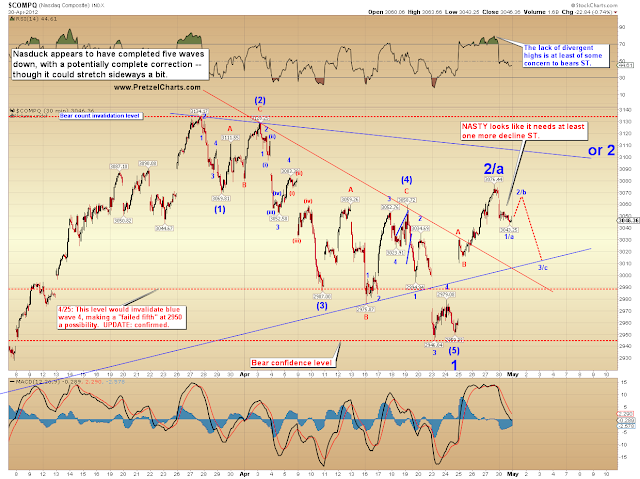 Because if this is just wave 1 of 3 of 5 we're talking about SPX near 1500 most likely. I just can't see that in the face of what's going on with currencies. Thanks for letting me pick through the pretzel bowl...I am trying to ground myself in logical decision making but the Beard is playing Jedi mind tricks, "These aren't the shorts you're looking for....Go about your business....Move along. Move along"
Somewhere between here (1412) and 1419. Here's a quick "edumacashunal" chart for those who've been trying to keep track of CVX. I guess that answers that question... ES 1411.. how high can it go? See the chart I posted above. So if I remember correctly from the part of F&P that was twisting me up, 4 should (can) retrace to the 2 of the previous lesser degree...or does it still have me twisted? I thought the minimum of a flat was 90% retrace of A, which it did. no, don't look for things that are not meaningful yet. A common retrace is to the 4th of one lesser degree. I'm talking basics. RSI, MACD, Stoch, etc.. Look for divergences on the short time frames before you jump in. If I were basing my opinion solely on F&P, the implication would be that this move CAN'T be a correction. Holly Crap.....go to one meeting, first day of the month and this is what happens? Hey PL, has the big move in /DX today done anything to help validate your expectation for higher levels or is it just more noise? I don't think this is 1 of 3, I think it's 5 of (likely) 1 of 5. I'm not certain the 'answer' ... perhaps it wouldn't be an expanded flat per se... just a simple double zigzag as a descriptor ??? I suspect DX has finally found a bottom, just as I expect eur/usd has found a top. This move could run. Stopped out on the open this morning at $106.87. Placed a "hard stop" on the short from $103.67 before the open this morning...damn biz meeting. Two reasons.....May tends to be an up first day of trading (PL's comment about fund flow) and if $106.80 was going to be my wave v and 2 then anything above that is BAD.....likely to hit the $108-$109 range and then move sideways for a bit, then down is likely. Took a $430 hit on the April ops and $320 on the short.....$750 loss. Back to the drawing board. You know something.... MAYBE (again, assuming it remains a correction below 1422) ... MAYBE it would count best as a relatively rare Triple Zig Zag ?!?! come on SPX Triple Ziggy! PL - Question - do you have an affiliate link for TD Ameritrade? I'm thinking of opening a 2nd Roth w/ them. Thanks. I trade stocks for fun but own a small contract manufacturing company for a living. Small company, but, we go way back to 1962. Jimmy Carter era was very bad, but, this economy is worse by a great margin and we don't see it improving anywhere in the near future. The nature of the beast has permanently been changed with the introduction of 0.02 cents per hour workers in China. It's like we gave a dollar to China, we get in exchange for that dollar 20 cents worth of cheap merchandise, but, we lose 80 cents in local/national income. Go figure how this helps the world economy. Can go into a long dialogue, but would take too much space. I don't believe these ISM numbers. Just some food for thought. I'll second (or third) that! take it back - say it ain't so !! Don't let it get you down though. That effect is showing up all over the place in TA I do and it's frustrating as hell. That's why I've often said that it's almost as though Goldman has purchased the rights to "logic" and has banned it's use. It's so distorted that it's almost unrecognizable in a lot of cases. It's like tipping over your coffee cup and the coffee lands on the ceiling. All upper gaps filled on $RUT (less 0.2 pts...close enough) prior to decline...As a kind and compassionate bear, I will forgive the bulls for this oversight...Now may we please proceed to fill the gap down at 798. Thank you for your cooperation in advance. I always like that one. Uh oh. 5 of 1 of 3 is even worse than I was thinking, lol. I hear ya man. I'm really, really, really torn about this one. The currencies story is huge, so huge that I simply can't overlook it. On the other hand market internals technicals can support the bullish count but are putting in what 'might' be a bottom from a level that is far from historic lows. They could go a 'lot' lower. AND, they are set up so that they could turn on a dime. But it would necessitate lows that are lower than today's low to do it. And moving averages can be interpreted so many ways that they're almost of no value at the moment. Which ones to we put emphasis on? In my humble opinion it could go either way and I absolutely do not count out the very bullish case even though it might sicken me to see it happen... because of "why" I think it would happen. PL - How would you reconcile this very bullish spx count with your view above (with which I don't quite yet concur but soon (3-4 days?) will be) that the dollar may have put in a bottom? Oh boy! I think AAPL is gonna finish in the red today. Forgot to say tanks for the clarification. I wanted to throw out there an alternate count to your alternate count. Are either of these counts viable? No link, just my obssevation over years of watching. . . I think we just witnessed a bit of a pump and dump....even my pet stock (RGR) is red. from plus 80 we go then back to 120 and finally to 140 up. PL...when I posted this on Friday I did not expect CVX to reach this fourth wave of one lesser degree. But here it is at $108.78 and the peak of the fourth wave (one lesser degree) was $108.79. Good lesson in EW analysis and parameters, as well as money management. The numbers within this wave up from the b bottom have changed somewhat, so you need to do a re-calc on those, but should be pretty close. if aapl falls under 580, that's not a good sign for up. Should hold that level and reverse. One additional observation......you're like a sponge! think my 06 will break soon. . . I think profit taking is coming. Correct....fourth wave of one lesser degree peaked at 3:00 PM on 4/2 at $108.79. You just had to say something, didn't ya? Glad to.....all learners here. Experience is a great teacher.....right behind PL. here are the tgts Clayton, 1403, then 1400. But last half hour can get really weird and hard to predict. this SPY 141.05 area is where the bulls would want to hold to print a 4th wave. I would like to bear just break it down. Another interesting chart on CVX is the OBV analysis. Smart money has been exiting CVX since way back in November 2011. ... forming a neg. divergence since January. Very nice. Old timer Joe Graneville indicator. Best application is daily volume versus price. Not an "only" indicator, but useful. nice close - ziggy zaggy, ziggy zaggy, ziggy zaggy, Oy! Oy!! Oy!!! This website is made possible by contributions from Readers Like You. Advertisers: This space for sale; reputable firms only please. Share this post on Twitter! Who's Pretzel Logic? And what's this Elliott nonsense? Disclaimer: The content on this site is provided as general information only and should not be taken as investment advice. All site content, including, but not limited to: forum comments by the author or other posters, articles and charts, advertisements, and everything else on this site, shall not be construed as a recommendation to buy or sell any security or financial instrument, or to participate in any particular trading or investment strategy. The author may or may not have a position in any company or advertiser referenced above. Any action that you take as a result of information, analysis, or advertisement on this site is ultimately your responsibility. Consult your investment advisor before making any investment decisions.